A word from the Quaker past which is still in current use in the Society today is “concern.” It means that a Friend, or group of Friends, feel a deep sense of religious compulsion, more powerful than a strong inclination, to carry out some action. Quakers are convinced that to be valid a religious outlook must always seek ways in which it can be translated into practice. Shortly after September 11, 2001, a small group of peace activists began standing at the corner of Highland St. and Major Taylor Blvd. in Worcester, Massachusetts every Tuesday afternoon from 3:30-5:00 pm. They selected the spot both because of its high visibility during that time of day and because it puts them in front of a World War I memorial. Some days there are a dozen or more keeping vigil; some days there may be just one or two. But they are there, every week, expressing their concern for America's ongoing war in the Middle East. 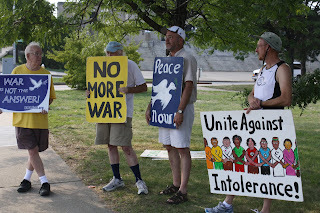 The two most regular protesters are Mike True, writer and self-described “Catholic Quaker,” and Scott Shaeffer-Duffy, a Catholic Worker who has been a longtime peace and social activist in Worcester. They were joined by just one other protester last Tuesday, the three of them keeping their lonely vigil as we showed up to participate and observe. My brother, Tony Lang, was in town on a stateside visit from his home in St. Andrews, Scotland, where he teaches International Relations at St. Andrews University. Tony loves politics of all kinds, so he was very happy to join me on my quest to see a Quaker concern in action. The Worcester vigil is not specifically a Quaker concern, but a number of Quakers are regulars there, Mike True the most devoted of them. As most people know, the Quakers reject all violent conflict, including and especially wars of any kind. They can date this policy back to a famous declaration made by Quaker founder George Fox, who wrote a letter to the English King in the late 17th century denouncing war and weaponry. Fox's purpose was to assuage the King's fears that the Quakers were a subversive group bent on revolution. Fox's commitment to peace has remained a mainstay of Quaker principles throughout its history. The Quakers can hardly be accused of cowardice, though. They have consistently risked life and limb to support unpopular reforms and social movements, most of which are ones that we take for granted today. They were the first religious group to officially condemn slavery in the United States; they have championed women's rights from their founding; they fought for better conditions for prisoners and the mentally ill during the centuries when those two groups wasted away in abysmal living conditions; they have been on the ground and delivering food and supplies during many of the world's great catastrophes, from the Irish potato famine to the conflicts in the former Yugoslavia. All of these actions stem from the Quaker conviction that religion must be lived. The hour of silent worship on Sunday mornings represents only one part of what it means to call yourself a Quaker; acting on your “concerns” is where Quakers really earn their religious stripes. I will confess that I was hesitant to seem like part of the protest; I immediately pulled out my notebook and camera and began acting more like an observer than a participant. My brother, though, picked up a sign and stood right next to the street, jumping in with feet first. He immediately blended right in: within a few minutes he was waving at supporters who drove by and discussing just war theory with Mike and Scott. During the thirty minutes or so that we spent there, I spoke with both Mike and Scott about what they were doing down there. What prompted them to commit themselves to this event every Tuesday? What did they hope to accomplish? I had to puzzle over that one a bit, but Mike's answer struck me as a pretty good justification for engaging in political actions which might seem quixotic at times—whether or not such actions change the world, they will almost always change one important part of the world: yourself. It also reminded me of a Quaker principle I had read about in Margaret Hope Bacon's history of the Quakers: “If you take a first step in obedience to religious impulse, a step in the Light, more Light will come.” In order for any change to occur, someone has to take that first step, even if that first step simply means changing yourself. In the meantime, as Mike and I were talking, I began to notice that the first driver who shouted at us was more of the exception than the rule. The vast majority of drivers who acknowledged us at all did so by honking their horns and waving, or making the peace sign and waving their hands out the window, or shouting messages of support. But my understanding of the meaning and worth of the protest really crystallized when I posed my question to Scott Shaeffer-Duffy. Scott was on his way to compete in a road race, and was decked out in his jogging outfit; he was holding a sign that said “Unite Against Intolerance” and depicted a multi-colored crew of people holding hands. It was after 4:00, and Tony and I had to leave. My wife had to take some of the children to soccer practice, and we were supposed to have dinner at the Boynton afterwards—back to the sleepy routines and pleasures of two middle-aged professors with careers and families. I know we both walked away from there, though, a little bit more awake than we had been when we got out of bed that morning.